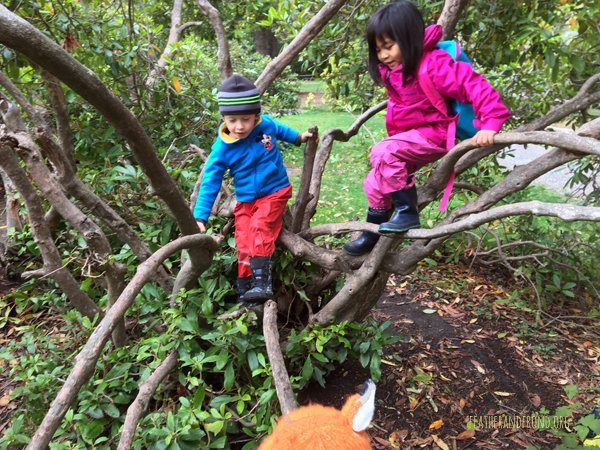 Screech Owls After-school Program - Wild Fun: Rain or Sun! "I'll take a closer look!" "Close your eyes and point towards the nearest Cedar tree..."
Burning off some energy like a squirrel would! What an Epic Sunny Day for Rolling Down a Hill! A safe way to split wood with a knife for our fire! Screech Owls has been off to a fun start this year. 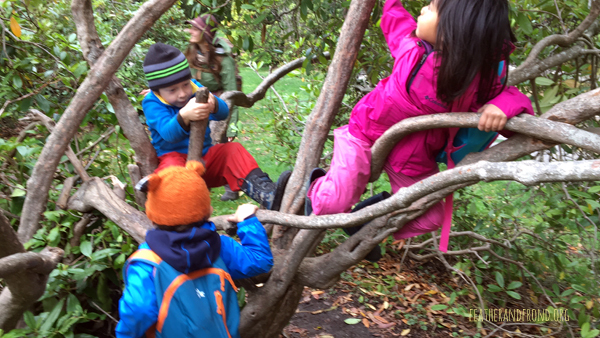 We have a small but mighty crew of Nature Adventurers who have saved up all of their energy on Tuesday mornings at school to come play and explore the forest in the afternoon with us. We have been blessed with both warm and sunny days as well as crazy winds and rain and have had a great time through all of it, there is no phasing these kids! Some highlights so far this fall have included making fire, batoning wood, making pitch torches, “Deer Jumping” over backpacks, “Cat Pouncing” off of rocks, climbing trees, playing with giant snowballs, hearing stories, singing songs, tasting wild edibles, sailing leaf boats down the creek and playing lots of games. We have had some amazing close encounters with nature including wild squirrels, bathing juncos, high-stepping deer and the most amazing was getting to check out a Great Horned Owl face to face in the forest! Most all of the kids said it was their first time seeing an owl and were full of reverence and awe at the chance -- super special! We have only have 3 weeks left in this session, but two more sessions this school year if you want to sign up your child! There is a 5 Week "Winter '18 Mini-Session" starting Jan 23rd and a big 13 Week "Spring '18 Session" that starts March 6th. Visit our Owl Eyes After-school Programs page for more info or Enroll now! Contact us if you are interested in having your child come out for a trial day. We are excited to see this group grow.